Haha, nice job, I really like it. little-tim wrote: Haha, nice job, I really like it. Heh-heh, are you gonna make a claymation with him? make sure he stands up!!! little-tim wrote: Heh-heh, are you gonna make a claymation with him? no, I'm giving it to the best submission to the knox's korner kollab. Oh I see, good idea, I really like him. Hope to see this a pico day!!! Heh-heh, me too! But why is this in the Clay Help forum? Also, I was just wondering if anyone else is making an animation for Pico Day? little-tim wrote: Heh-heh, me too! But why is this in the Clay Help forum? I might too, but maybe not. I need to buy some more clay, I haven't been doing much animating lately, I've been kinda busy. little-tim wrote: I might too, but maybe not. 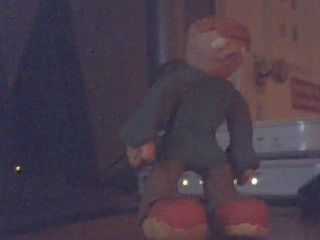 I need to buy some more clay, I haven't been doing much animating lately, I've been kinda busy. but not in an evil way but just doing a few miner tweaks now and agian at least once a mounth! Okay, I'll pm you some questions that I have about being an admin. Lolz, kewl now ughanation joined, hey Ugha!